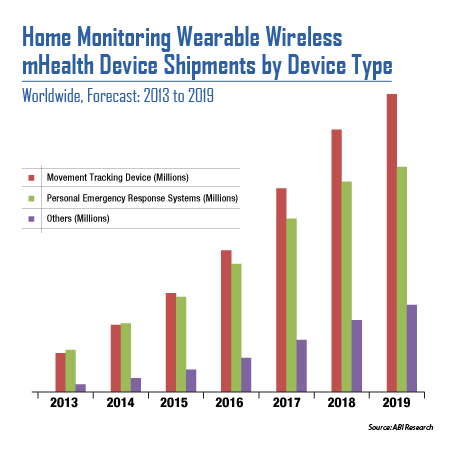 Home Monitoring mHealth Wearable Devices 2013-2019 | What's The Big Data? Over the next 5 years, a new generation of elderly home care services will drive wearable device shipments to more than 44 million in 2019 up from just 6 million in 2013. In 2014 alone, shipments of wearable devices linked to elderly care systems will more than double over those in 2013, finds the latest ABI Research analysis of the mHealth market. Growing adoption comes as tech savvy families increasingly turn to home monitoring offerings for assurance their aging parents and family members are safe and well. In addition, new offerings are boosting and extending a market that has long been the territory of dedicated, “Help! I’ve fallen and I can’t get up”-type personal emergency response systems. A host of niche players including BeClose, GrandCare Systems, Independa and others have all emerged to capitalize on a combination of market demand and the potential to leverage connected devices and systems. In the past few months alone, one start-up, Live!y, has revamped and re-launched its offering to include a watch that offers activity tracking alongside personal emergency response services, while AT&T has added elderly care monitoring to its Digital Life smart home package. These players reflect how device manufacturers and service providers alike are increasingly targeting the elder care market and doing so with more feature rich offerings. These findings are part of ABI Research’s mHealth Wearables, Platforms and Services Market Research which looks at the rapidly developing market for wearable wireless sensors, by device, connectivity and region across sports, fitness and wellbeing, home care monitoring, remote patient monitoring, and on-site professional healthcare markets. This entry was posted in Health Care, Wearables. Bookmark the permalink.